If you are a leader or manager looking for an accomplished coach to help with your personal and professional development, try a horse. Equine-assisted leadership sessions are a proven, highly effective and rewarding way to hone or discover the skills critical to being an influential leader. Interacting with horses allows us to gain profound insights into ourselves, our resources and challenges, our alignment with our values and intentions, and the interference of old thinking and behavior habits. As a prey species, a horse’s flight instinct becomes an uncanny, non-judgmental feedback tool for humans. Horses sense and respond to the intentions, thoughts, and emotions that our body language subconsciously reveals to them. Through the experience of observing a horse’s response to our requests and directions, we can learn how to communicate more effectively, how to recognize our fears and control our emotions, and how to become more consistent with our values in our behavior. Our equine assisted leadership sessions reinforce relationship management skills through one-on-one interaction with individual horses, as well as exploration of herd dynamic. 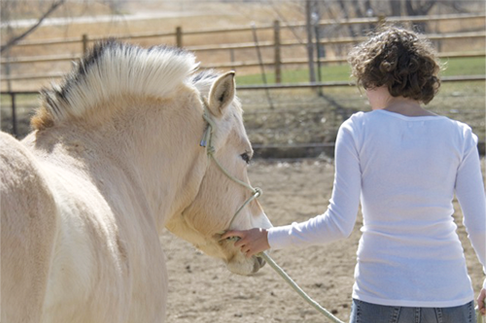 The focus of our sessions is not on learning horsemanship skills. It is about acknowledging and better understanding our own weaknesses and strengths, challenges and competencies through interaction with one of humankind’s oldest animal partnerships. The horse is an effective teacher of presence, intention, communication, and determination. For the seasoned or the emerging leader or manager, an equine assisted coaching session can be nothing short of transformational. We offer our services in English, Spanish, and French to corporations, non-profit and learning organizations. We welcome co-facilitation with other coaches and training institutes. We have conducted workshops with groups from UCAR; Johns Manville; Women’sVision Leadership Institute; Leadership Ascent for Women and Men among others, and worked with executives from both the corporate and non-profit worlds, including from Covidien; First Data Corp.; Western Union; Mi Casa Resource Center; Key Equipment Finance; Centura Health at Home; CenturyLink; CSG International; Vail Valley Medical Center; IQ Navigator; Rocky Mountain Hospital for Children; Trizetto; Alexander Dawson School, etc. As a participant, Jean-Jacques and the horses kept my team of 13 executives busy discovering their personal strengths and weaknesses in a completely non-threatening, yet intellectually challenging series of exercises. As the director of a year long executive leadership development program, my team of professionals continually referred back throughout the year to their "horsemanship" experience at Twin Oaks as metaphors for lessons learned about relationship development, strategic thinking, team work, self-awareness, and self-management. As a co-facilitator with Jean-Jacques, I was both honored and humbled to be a part of such an important and extremely effective methodology for conveying the critical values of self-awareness and personal/professional relationship management compliments of Jean-Jacques expert coaching/facilitation skills and the uncanny insight of the horses of Twin Oaks. I always came away from every session a better, more integrated person. There is truly no more powerful way to understand oneself and one's relationship to others than through a coaching with horses session with Jean-Jacques Joris at Twin Oaks Farm! We have used the equine-assisted leadership training at Twin Oaks farm for several of our leadership development programs, and have found them to be both valuable from a leadership-learning perspective and impactful from a personal insight perspective. I highly recommend their leadership training. "I LOVED IT! It was a nice balance of exercise introduction, exercise, reflection and discussion..."
"Jean-Jacques did a great job tying in his knowledge to leadership to help each of us learn and grow." "VERY powerful lessons learned that will stick with me." "I quickly became aware of the applicability of the activity." "Extremely engaging, and the activities were presented in a manner that continually held my interest." "None of the activities were rushed, and we were provided adequate time to debrief before moving onto the next." The Leadership Ascent for Men is a year-long leadership program for mid- and upper-level leaders that begins with a 2 1/2-day retreat. For the last three years, Jean Jacques Joris has facilitated a half-day equine experience at Twin Oaks Farm for the retreat participants. Each year, Jean- Jacques has increasingly tailored his facilitation to meet the needs of leaders, creating significantly meaningful experiences for our participants. They leave Twin Oaks with a deeper understanding of themselves and of many of the intangibles of successful leadership. The equine experience is referred to frequently throughout the year and has become a cornerstone of our program. On behalf of the many leaders who have benefited from Jean Jacques's equine experience, as well as the program facilitators, I recommend Jean Jacques and his services wholeheartedly.